Keep this this dividend-paying trio in your sights. "Buy and hold" is something that you hear all the time when it comes to investing. But finding stocks you can buy and hold forever isn't as easy as it looks. A key ingredient that is often overlooked by investors is a reason to stick around during the inevitable bad times. That's why these three longtime dividend payers should be on your short list. Imagine your life without electricity. I bet you can't do it, or at least wouldn't want to do it. That's why Consolidated Edison (NYSE:ED) is a stock you could buy and hold forever. Con Ed, as it's known by its customers, provides power in one of the largest cities in the world: New York. Its reach extends into the Big Apple's wealthy suburbs, too. In total it provides electric services to roughly 3.3 million customers and gas services to 1.1 million. It also sells steam -- yes, steam -- in New York City. Here's the catch, though, Con Ed's main service is delivering power (electricity and gas), not making it. Con Ed basically passes the cost of power on to its customers; it's a middle man. This is important because the power market is changing, with renewable power becoming a bigger player. Only Con Ed doesn't care so much about how power is made, only that it gets to keep delivering it. Cutting ties to the power company would be hard to do in New York City and much of the surrounding area because the region is so developed and dense. That said, the utility's first-half adjusted earnings of $1.78 a share were down 12% year over year. Although that's still on track with the company's full-year projections, you might be worried. Step back and focus on the fact that Con Ed provides something everyone needs to a populous and wealthy region where finding a replacement would be difficult if not impossible. And also keep in mind that the company has raised its dividend for 42 consecutive years. It currently yields around 3.5% or so. That dividend and the regular annual increases give you something tangible to hold on to when times are tough. If you are looking for a stock to hold forever, Con Ed is worth a deep dive. Oil gets a bad rap today because it's dirty, but it's hard to beat when you look at cost, ease of use, and mobility. In fact, although consumers around the world are, indeed, making the switch to electric vehicles, it's a relatively slow-moving trend. That should give ExxonMobil (NYSE:XOM) plenty of time to keep selling oil while it shifts its business around (for example, by increasing the amount of natural gas it sells, a fuel that's increasingly used in electricity generation). But oil and gas are commodities and their prices are depressed right now. That's led some of Exxon's biggest competitors to stop increasing dividends or, worse, cut them. But not Exxon: It raised its dividend for the 34th year in a row in the second quarter. (The recent yield is around 3.4%.) And even during these tough times, Exxon is still turning a profit, with earnings of around $0.84 a share in the first half of the year. That was down a massive 61% year over year, but the takeaway is that, unlike many peers, Exxon is still in the black despite the headwinds it's facing. 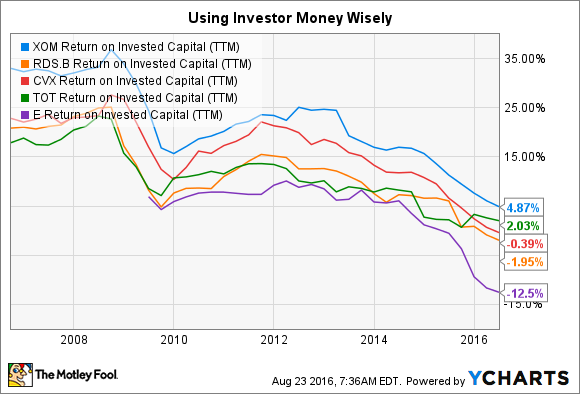 XOM Return on Invested Capital (TTM) data by YCharts. So you can take solace in the dividend and the company's ability to turn a profit in tough times. But there's more to like about Exxon. It happens to be one of the best run oil and gas companies around. A good way to look at this is the company's return on invested capital -- a measure of how well a company is putting its shareholders' money to work. Exxon is normally at the head of the pack on this metric. So stay for the dividends, but don't forget how well run Exxon is, either. Another name that should be on your list of buy and hold forever stocks is Emerson Electric (NYSE:EMR). This industrial giant has a long and storied history behind it, including 59 years worth of annual dividend increases. Industrial companies, however, tend to be cyclical, and Emerson is facing the downside of the cycle today. For example, it's expecting fiscal 2016 underlying sales to be down between 5% and 6%. But Emerson has been through downturns before in its long history, including during the last 59 years' worth of dividend hikes. It's a master of adjusting its business to what it believes will be the best for shareholders over the long term. For example, it recently inked a deal to sell a relatively low-margin division focused on data centers and to buy a business that will augment its core strengths in industrial automation. You have to trust that management knows what it's doing with any investment you make. Fortunately, however, the dividend history at Emerson provides some additional comfort. Notably, the current yield is around 3.6%, toward the high end of its historical range. That could make now a pretty good time to take a look at a longtime dividend payer that is used to changing with the times. A big part of making money in the stock market is simply sticking around long enough to benefit from a company's long-term growth. That's harder to do than it looks, which is why "buy and hold" is a great mantra that so many people fail to follow. But Con Ed, Exxon, and Emerson all give you a big reason to stick around through those tough periods: regular dividend increases. If you are looking for stocks to buy and hold forever, this trio and their impressive dividend histories should be on your short list.